Our Skin Resurfacing Laser will leave your skin refreshed, radiant and resilient. Skip the scalpel, love the laser! Age 25+ with concerns including: sun spots, fine wrinkles, uneven skin texture, skin discolorations. 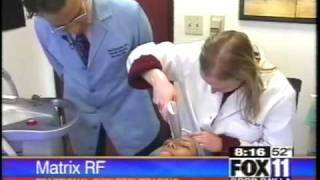 The Matrix RF uses an array of radiofrequency energy precisely directed to tiny matrix spots. The healthy skin around the spots accelerates the healing process of the skin. Post treatment, increased levels of beneficial collagen and new healthy skin cells are produced. Mild to moderate wrinkles and superficial skin discoloration are reduced, and skin texture becomes more smooth and elastic. Each treatment lasts approximately 1 hour. After 1 treatment, you will see improvements but for permanent results, we recommend 2-3 sessions, spaced 4-6 weeks apart. There are 2-3 days of downtime after each session.